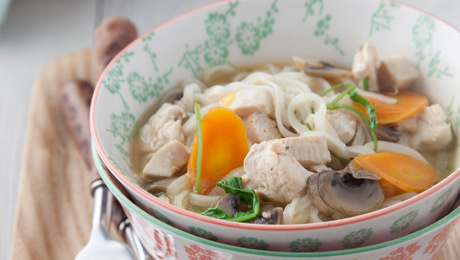 Made with rice noodles instead of wheat this chicken noodle broth is fragrant and flavourful. Warm the chicken stock in a pan and add the carrots, celery, leek and onions. Make a bouquet garni with the bay leaves and the thyme by tying the herbs together with a little kitchen string. Add the bouquet garni to the stock along with the peppercorns and salt. Cover the pan with a lid and bring to the boil, then reduce the heat. Simmer for about two hours, skimming off any scum that rises to the surface of the liquid from time to time. Set aside to cool slightly, then strain the stock into a smaller pan. Add the diced chicken and return to a gentle heat for approx 6 minutes then add the noodles. Cook for a further few minutes until the noodles have softened, then stir in the chopped parsley.Season as necessary.